VPN (Virtual Private Network) software can be used to anonymize and encrypt internet traffic originating from your PC, ensuring a more private and secure environment that can usually prevent snooping by your service provider, hackers and even government agencies. Many companies use VPNs so that their employees can access their work network remotely while maintaining an acceptable level of security. Individuals often run VPN software for privacy purposes, letting them mask their true identity and location while browsing the web and performing other online tasks. 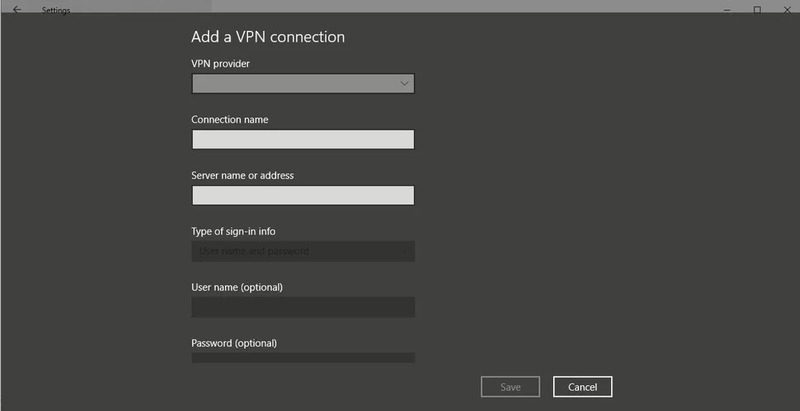 Below are multiple ways that you can set up a VPN on your Windows 10 device. Typically recommended for more advanced users, Windows 10 features a built-in interface that allows you to manually set up a VPN connection from right within the operating system itself. Although this method does not require any third-party software, in order to take this path you should already be subscribed to a VPN service. Most employers will provide software for a work-related VPN connection, usually through a third-party like Cisco, so the do-it-yourself approach outlined below is typically for personal use only, with some exceptions. No matter the reason for setting up your connection, you’ll need your VPN settings before continuing on with the steps below. These details can be obtained from your employer or VPN provider, and can sometimes be found on their respective websites. Click on the Windows Start button, located in the lower left-hand corner of the screen. 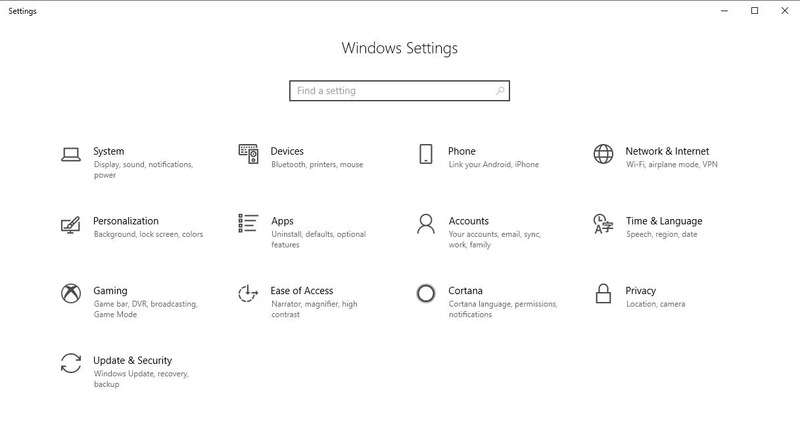 When the Start menu appears, select the Settings (gear) icon. The Windows Settings interface should now be displayed. Click on the Network & Internet option. Select VPN, located in the left menu pane. The VPN Settings interface should appear. Click on the plus (+) button, labeled Add a VPN connection. The Add a VPN connection form will now be displayed. 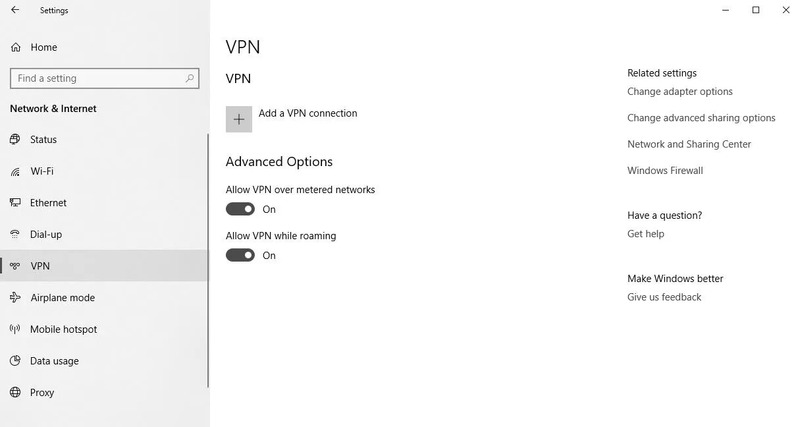 Click on the VPN provider drop-down menu and select the Windows (built-in) option. Enter your desired label in the Connection name field. This will only be used for reference purposes and can be any name that you want. Enter the address obtained from your employer or service in the Server name or address field. Click on the VPN type drop-down menu and select from one of the following options: Automatic, PPTP, L2TP/IPsec with certificate, L2TP/IPsec with pre-shared key, SSTP, IKEv2. Consult with your employer or VPN provider if you’re unsure which type you should be using. Click on the Type of sign-in info drop-down menu and select from one of the following options: User name and password, Smart card, One-time password, Certificate. This will dictate what type of credentials you’ll use to authenticate to your new VPN setup. You can also enter your username and password in the remaining fields if you like, avoiding the need to type them each time you connect. Once you’re satisfied with your form entries, click on the Save button to complete the process. 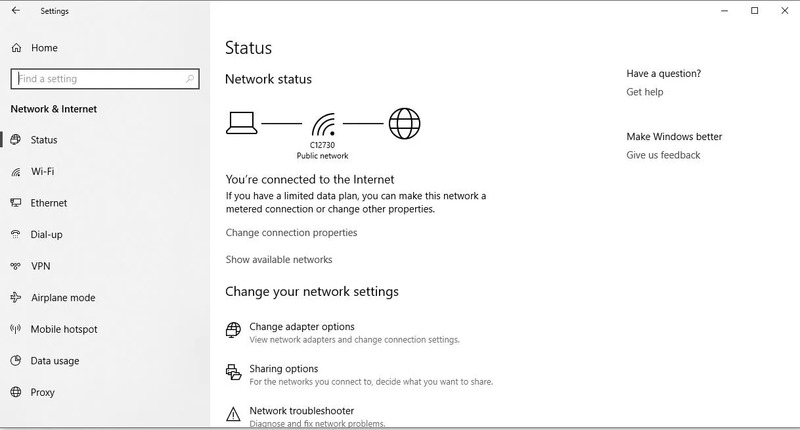 Your new VPN connection can be accessed via the Network icon, found in the lower right-hand corner of the Windows taskbar, or through the aforementioned VPN Settings interface. 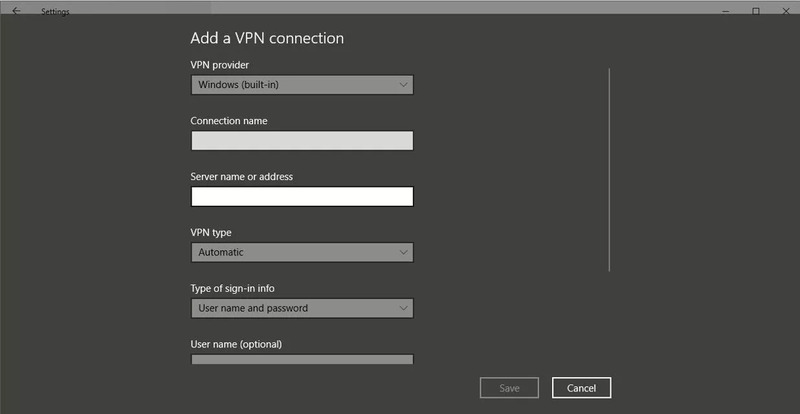 A simpler and more common way to set up VPN software on your Windows 10 device is by utilizing a third-party application such as the ones listed below. A favorite of many companies, Cisco’s AnyConnect Secure Mobility Client allows end users to access a VPN with little more than an internet connection and a password or token. You’ll need your target VPN’s host address and other pertinent details, of course, which are typically provided by your employer or whatever party is supplying access to the virtual network. Costs for setting up your own VPN with Cisco vary based on need and size, but you can download the aforementioned client for Windows free of charge. OpenVPN‘s offerings run the gamut from employee access to individual privacy configurations, making the open-source option one of the most flexible around. Like Cisco, costs and requirements vary based on your specific needs but OpenVPN’s freely-available source code along with a thriving contributor community that includes very active forums makes it the top of choice of many users. If you just want to use a VPN service on Windows 10 without having to configure any settings or choose which software to install, your best bet is to sign up for a VPN provider that sets you up with their own software on their own network, often in return for a monthly or yearly fee. Once you’ve subscribed and installed their proprietary software, a simple mouse click should get you connected to a VPN whenever you need it.